San Francisco is one of the prettiest cities I’ve ever seen. Whether you’re talking about the location right on the bay, the various forms of unique architecture, or the numerous steep hills, San Francisco has something beautiful from every vantage point. The city is amazing in daytime, but I think where it really comes alive is at night. 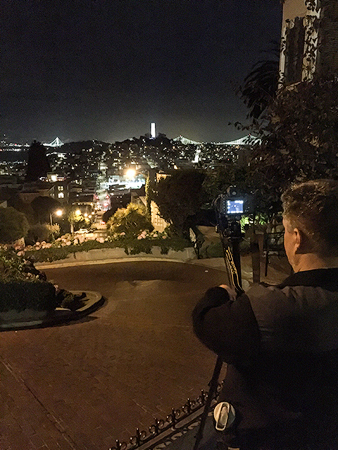 Mike and I met a group of 7 photographers for a fun night of exploration in and around San Francisco. 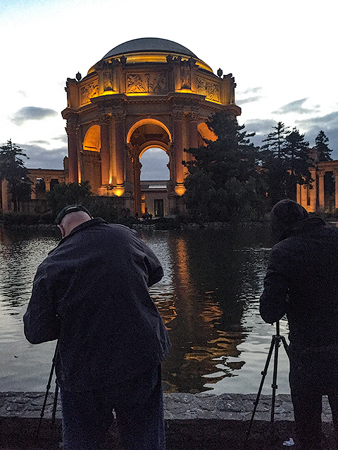 We started out journey at the Palace of Fine Arts, this awesome piece of architecture was built as a temporary exhibit in 1915 but after the city fell in love with the structure, it was rebuilt to last and now stands as an iconic location for visitors from all over the world. We love to start our workshops here. As the sun fades from the sky, and the lights come on our groups are treated to a great balance of warm and cool tones. The warmth from the lights on the structure, and the cool tones of the blue hour make a really special photograph. Mike and I help the group get the gist of the settings we’ll be using, and then help everyone get dialed in on their compositions. The reflections of the buildings on the pond that sits in front of the building make a really nice image. 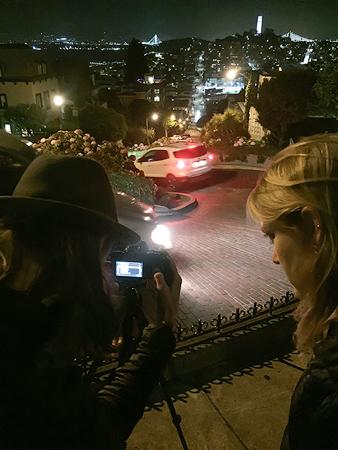 Our next stop of the evening is the wondrous twists and turns of Lombard Street. Here we take our exposures up a notch and begin to incorporate some moving lights into the equation….as we take long exposures from the stability of a tripod, anything moving within that frame during the exposure will leave behind a streak of light…in this cast the headlights and taillights from the car leave behind very cool light streaks. This stop is always great for folks as they start to really see what is possible with their images when shooting at night. 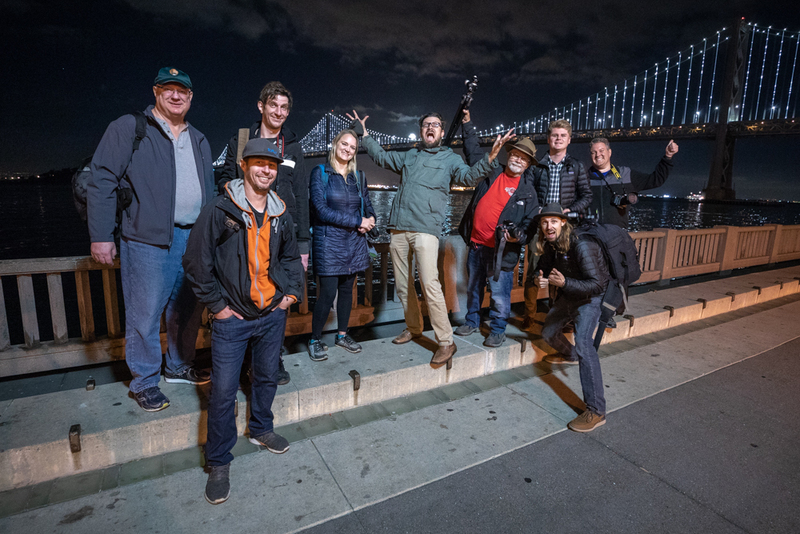 No trip to the city is complete without a shot of the Bay Bridge, so we roll our van of photographers down to the Embarcadero for a couple different shots of the bay bridge with the old pier pilings in the foreground. We move along the walkway there utilizing different street lighting on the pilings to show how that affects the feeling and mood of the images. Our last stop of the night is the Golden Gate Bridge from the fishing pier north of the bridge. The clouds above the city tonight were AWESOME, it was really fun to see how these images turned out. They had a great dark mood to them that was very cool. 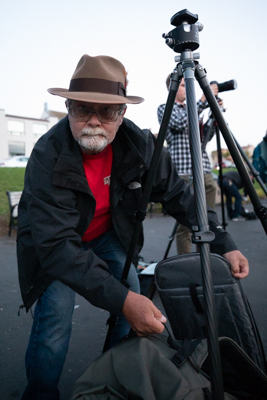 Time flies though, and midnight was upon us…time to head back to the vehicles and let everyone go home to get a good night sleep and sift through all the great images they collected. 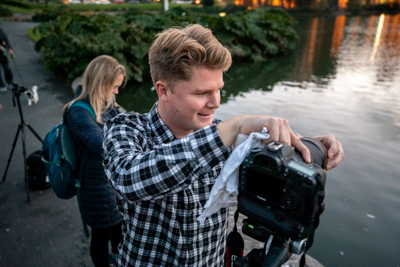 One thing that we really like about this class is that each spot typically yields one really great image…and we saw all of them on the cameras on this night! Great Job!